Photographer Andrew Ross has said that ‘frontier societies like New Zealand [lack] the visible evidence of our history. It gets nipped in the bud…[and] you hardly get any sense of what has happened more than ten years ago.’ You only have to look at his work in the Collecting Contemporary exhibition now on at Te Papa to see how right he is. 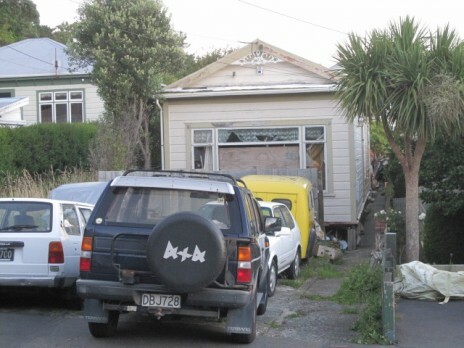 Of the eight photographs on display, taken between 2001 and 2007 in Wellington, the subject of the three have vanished at the hands of bulldozers, and at least one looks set to go at any time. I know this because I went out this week and visited the site of several of the photographs and took shots of the same places. What struck was just how un-noticeable so many traces of the past are. Take Bruce Lawrie’s upholstery business in Kilbirnie. It’s a completely run-down building sandwiched between the electoral office of Chris Finlayson and an after-school education business. 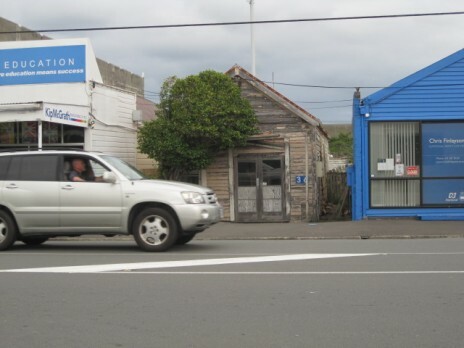 Modern life streams past, cars hurrying between the petrol station, supermarket, and megastores of Lyall Bay. Who has a need of upholsterers these days? ‘Out with the old and in with the new’ is the motto of commerce today. Andrew Ross. Bruce Lawrie Upholstery, Coutts St., Kilbirnie, 23/6/2003. Te Papa. As for the Murdoch’s icing sugar, spice and pickle factory in Taranaki St and a house in Arthur St, they have vanished without a trace. Well, with just a bare trace in the case of Murdoch’s. 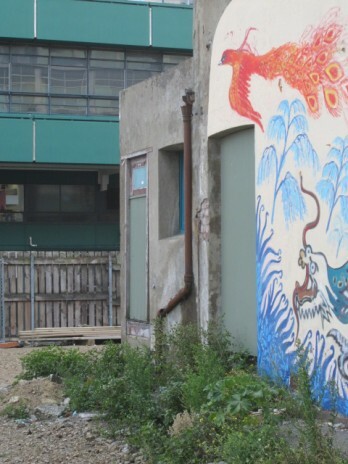 You can see a door and pipe that appeared in Andrew Ross’s photograph of an alleyway between the factory and the still standing Chinese Mission church next door. Today they are exposed to the open air rather than hidden in a dark back alley. Andrew Ross. Entrance to Murdoch’s factory, off Frederick St., 22/9/2007. Te Papa. 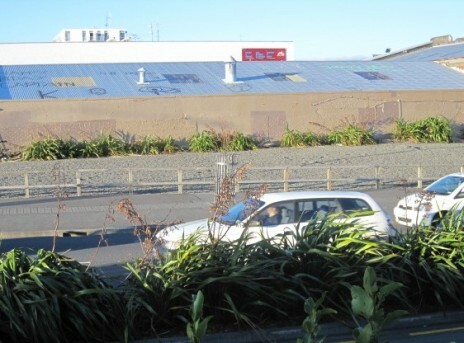 The Murdoch’s factory was set to be replaced by an apartment building back in 2007, but nothing much seems to be happening, and the Arthur St house site is a barren, windswept buffer zone beside what has become SH1. Andrew Ross. 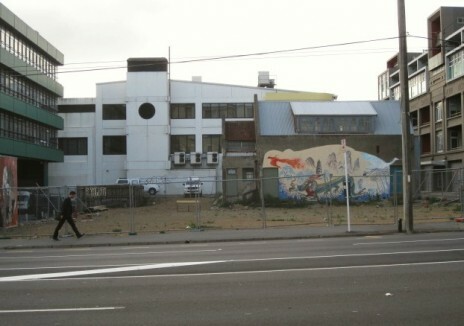 Murdoch’s factory, Taranaki St., 21/3/2007. Te Papa. Andrew Ross. Side view of 8 Arthur St., 15/10/2004. Te Papa. What I also realised when taking my photographs was how investigative Ross must be, for he pokes around behind the street frontages that we take for granted. Like my photograph of this house in Mein St, for example. You can see a hint of a backyard spilling junk when you carefully look down the side of the house. Perhaps Ross noticed this and knocked on the door to ask if he could have a look around the back. Exactly how he would have explained himself, I’m not sure. But maybe the owner was pleased they had someone who appreciated a decent yardfull of ‘things that might be useful one day’. Andrew Ross. Backyard, 116 Mein St., Newtown, 11/8/2007. Te Papa.